A great book that includes info about A PINCH IN TIME (1948) and Hugh Herbert, as well as all the other comedians at Columbia Pictures' shorts department. 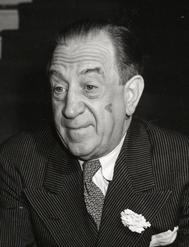 Emil's thirty-fourth professional film assignment marked his thirtieth appearance in a Columbia short-subject "two-reeler" and his third role in a Hugh Herbert comedy. 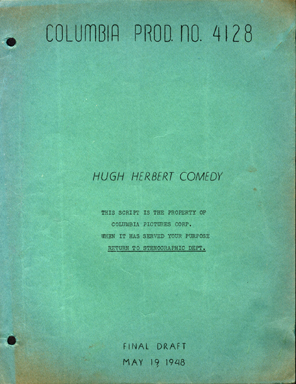 Hugh Herbert starred in a lengthy series of comedy shorts at Columbia Pictures, making twenty-three films for the studio between 1946 and 1952. He had also previously appeared as a character actor in scores of films starting in the 1920s. Herbert was known for a peculiar kind of comical dithering and mumbling, during which he seemed to be thinking out loud. He also had a trademark "woo, woo" utterance that is sometimes credited as the inspiration for similar sounding "woo, woo" expressions used by other comedians such as Ed Wynn and even Curly Howard of The Three Stooges. For A PINCH IN TIME, Emil plays a bartender in a hotel lounge, while Hugh Herbert plays a forgetful memory expert who stops by the bar. Although his role has several lines, it was only another small bit that allowed for very little character embellishment. Nevertheless, it had been two months since Emil worked in a film, and he was grateful for the job. I was happily and very cheerfully once again "the actor, Emil Sitka" - and promptly checked in at Darmour Studio this morning at 11 A.M. But I didn't start emoting until after lunch. I introduced myself to Del Lord, the director whom I've never before met - and found him easy to work with. I was easily within Del Lord's good pleasure. He liked my little scene with Hugh Herbert - and I felt like he might use me in future and bigger roles - if he has a "say" about it. A surprise of surprises - and good news it was! A phone call, on the set (unusual!) informs me it is George Godfrey of Casting Office. And that he has a good part for me in another comedy next week! I almost collapsed with joy! I was picked up by Symona Boniface & treated to supper. Then we rehearsed at the Kay Dance studio on Highland Ave.
Del Lord was a prolific film director who began his Hollywood career as one of the Keystone Kops, steering one of the paddy wagons in the chaotic stunt-driving scenes. It is generally accepted that Del Lord was the most influential director to guide Larry, Moe and Curly while they established their individual Stooge personalities. 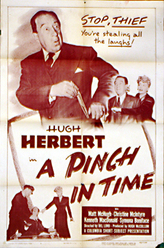 A PINCH IN TIME was written by Ellwood Ullman and the cast includes Christine McIntyre, Kenneth MacDonald, Matt McHugh, Symona Boniface, Vernon Dent, Lynne Lyons, Heinie Conklin, Chester Conklin, and Robert Williams. In his diary entry above, when Emil mentions rehearsing with Symona Boniface, he was referring to a revival of "The Viper's Fang," the same play he was performing when he was first noticed by Columbia talent scouts back in 1945. Symona Boniface, who also appeared in A PINCH IN TIME (as well as many Stooge shorts), wrote and acted in "The Viper's Fang."